This lesson explores the journey of the African people from the Yoruban and Dahomean cultures to the Caribbean through the forced migration of the trans-Atlantic slave trade. Students will learn about the similarities of the music found all over Latin America in the countries Haiti, Cuba, Trinidad, and Brazil. Prerequisites: Students should have a basic understanding of rhythm and rudimentary musical literacy, such as reading compound time signatures and eighth note patterns. 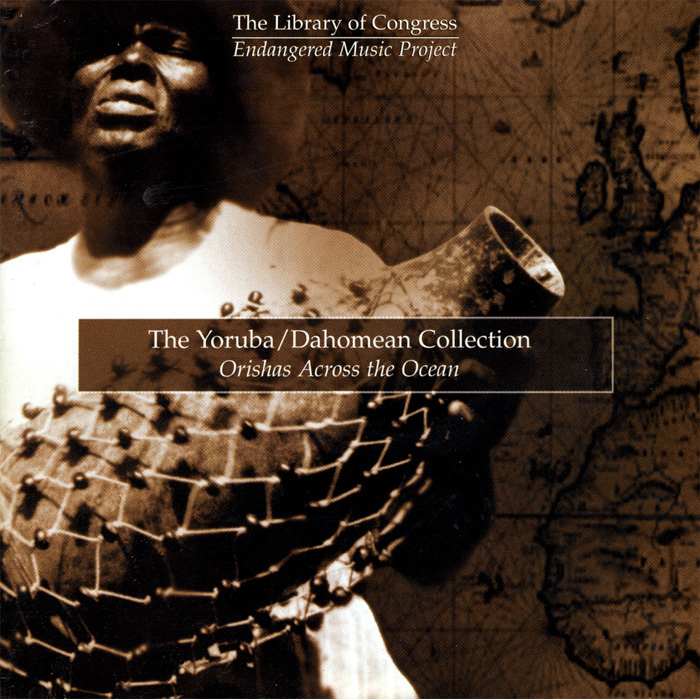 Recommended prerequisites for the instructor: Listen through the recording of The Yoruban/Dahomean Collection: Orishas Across the Ocean and read the related liner notes to provide valuable background information on this lesson. 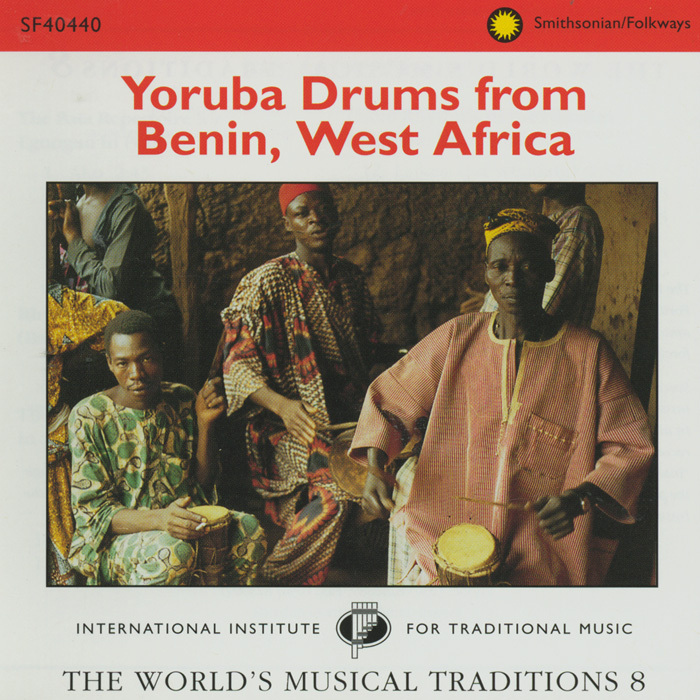 This lesson focuses on the traditional sacred music of the Yoruban culture in Benin, Africa, that eventually traveled across the Atlantic to the new world. 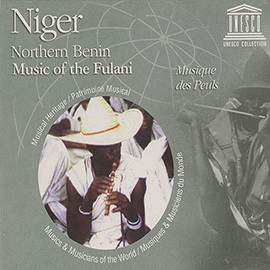 Play the recording of “The Bata repertoire for Shango in Sakété: Lade Lade”(Yoruba Drums from Benin, West Africa, track 9) from the beginning until 0:40. Have the students play along while listening tothe recording the next few times. The students can start to play on differentbody parts to signify the various drum parts. Then the students can playdifferently tuned congas or other hand drums if available. On thistime through the recording, have the students play the low melody on two drums (thelower line transcribed below). On thistime through, have them play the highest pitch (the higher line of consistenteighth notes). You can have them play this on rhythm sticks or claves or clapthe pattern if instruments are not available. Now dividethe class in half and have the first group play the lower part and the secondgroup play the high part. Do this again and have the class switch roles. ShowBenin on the globe or on a map (shown below). Benin is just to the west ofNigeria. Describethe language of Yoruba and explain that it is a tonal language. The tones ofthe words change the meaning of the word. Therefore, the drums can “speak” theYoruban language by making different melodic composite rhythms as the classjust did. Explain tothe class that this area of West Africa was a main area of the trans-Atlanticslave trade, which spread these musical cultures all over North and SouthAmerica. Have the students trace the voyages of the trans-Atlantic slave tradeon the globe. Assessment: The students can demonstrate musical proficiency by accurately playingthe melodic drums parts written above. The students can demonstrateunderstanding of the historic material by answering questions based on themusic, topics discussed, and material presented gleaned from the liner notes. This lesson focuses on the Dahomean culture brought fromBenin to Haiti through the slave trade by the French colonizers. The Dahomeypeople practice the faith of the Orishas (the “saints,” or gods) just like theYoruban people, but in the Fon language. The Orishas are instead called “Vodu”in Fon, and so Orisha worship became known as “Vodun” in Haiti. Play “Papa Legba Ouve Baye” (Orishas Across the Ocean, track 1). Have theclass focus on the following elements, each time with a new listening of thetrack. Discussthe vocal quality with the students. Then have students try this by giving anexercise such as calling for a taxi, “Hey, taxi!” or calling in a crowdedstore, “Hey, Mom!” This way the students can try to emulate the vocal style ofthe recording without straining their voices. Explain why this vocal style isused, to carry the voices over the volume of the drums. Play therecording a third time. Ask students to find the beat that the rattle isplaying. Have the students clap with the rattle. Have students stand and play the recording infull again. This time ask the students to do this simple step along with therecording. The stepgoes side to side and starts to the right: R, L, R, L and reverse L, R, L, R.Teach the steps first without the music by demonstrating, then combine it withthe music. Foradvanced students, have them continue the steps and hum (or sing on neutralsyllables) with the chorus along with the recording. ShowHaiti on the globe or on a map (shown below). Haiti is just to the east ofCuba. Describe that the music of Haiti is directly related to the music of Benin from Lesson 1. Show thedistance between Benin and Haiti on a globe. If time allows, play the recordingsfrom Lessons 1 and 2 back to back. Assessment: The students can show proficiency by accurately finding the beatand being able to move physically in line with the beat. Students candemonstrate understanding of the material by describing how this music came toexist in Haiti. Play “Bori Songs (initiation rites)” (Orishinas Across the Ocean, track 5, starting at 1:32). Havethe class focus on the following elements, each time with a new listening ofthe track. Play therecording a third time. Ask students to listen to the iron bell. Have thestudents clap with the bell. ShowBrazil on the globe or on a map (shown below). Brazil is a large country on theeast side of South America. 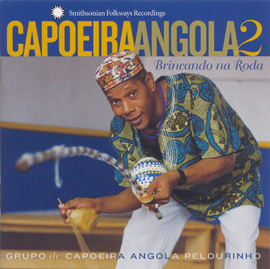 Describe that the music of Brazil is directlyrelated to the music of Benin and the music of Haiti from Lessons 1 and 2. Show thedistance between Benin and Brazil on a globe. Play the recordings from Lesson 2and 3 back to back. Can they hear the similarities in the sound of the music? Assessment: The students can show proficiency by accurately finding the beatand the bell pattern. Advanced students are able to move physically in linewith the beat while clapping the bell pattern. Students can demonstrateunderstanding of the material by describing how this music came to exist inBrazil. This lesson focuses on twocountries in the Caribbean that also have developed Yoruban and Dahomean Orishatraditions. The Spanish colonized the island of Cuba and brought slaves fromBenin. The descendants of West Africans in Cuba practice a form of Orishaworship called Lukumi. In this lesson students will hear a Lukumi song andcompare it to the Orisha traditions found on the other end of the Caribbean inTrinidad. The practice on the island of Trinidad is known as Shango. Play the recording of “Ochun Talade” (Orishas Across the Ocean, track 15) fromCuba.Have the class focus on the following elements, each time with a newlistening of the track in full. Have thestudents listen to the vocal quality of the singers. Does this remind them ofthe vocal style heard in the previous lessons? Play therecording a third time. Ask the students to find the rhythm played by the ironbell. Have the students clap with the bell. Play the recording again. Ask the students to focuson the singing. Have thestudents listen to the call-and-response form of the song. Play therecording another time and have the students hum along with the chorus. Give thestudents the score and lyrics and have them sing the chorus with theappropriate words (transcribed below). ShowCuba on the globe or on a map (shown below). Cuba is the most western island inthe Caribbean chain located just south of the state Florida. Describe that themusic of Cuba is directly related to the music of Benin from Lesson 1. Play the recording “Yariba-Ochun” (Orishas Across the Ocean, track 21) fromTrinidad. Have thestudents listen to the vocal quality of the singer. Does this remind them ofthe vocal style heard in the previous lessons? ShowTrinidad on the globe or on a map (shown below). Trinidad is the most easternisland in the Caribbean chain located just north of the South American countryVenezuela. Describe that the music of Trinidad is directly related to the musicof Cuba (including the same lyrics and melody of the example songs). Alsodescribe how Trinidad is related to Benin from Lesson 1. Show the distance between Cuba and Trinidad ona globe. Now show the distance between all five countries studied in theselessons: Benin, Haiti, Brazil, Cuba, and Trinidad. Review from the first lessonand play the recording from Lessons 1 through 4 as a quick comparison of themusical similarities. Assessment: The students can show proficiency by accurately finding the beatand the bell pattern as well as sing the song “Ochun Talade.” Advanced studentsare able to move physically in line with the beat while clapping the bellpattern. 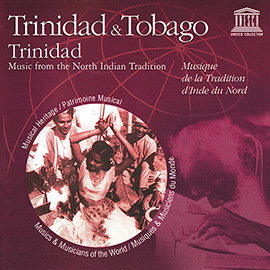 Students can demonstrate understanding of the material by describinghow this music came to exist in Cuba and Trinidad. Students can describe therelationship between all of these countries and how the Yoruban and Dahomeanpeople came to live in Cuba, Haiti, Brazil, and Trinidad.